Bang & Olufsen unveils Beovision Harmony TV and sound system | What Hi-Fi? 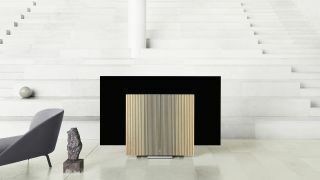 Bang & Olufsen has used Milan Design Week to unveil its Beovision Harmony all-in-one TV and speaker system. A three-channel speaker system, housed in oak and aluminium, conceals the Harmony’s 77-inch LG OLED C9 television screen while the system is turned off or playing music, and fans out in a butterfly-like effect as the screen raises to ideal viewing height when switched on. Despite its lavish design, the Harmony promises to work much as any modern home cinema sound system, with services such as Tune-In and Deezer integrated and streaming possible via Apple Airplay 2, Chromecast built-in or Bluetooth. A built-in 7.1 surround sound decoder and B&O multi-room capabilities also allows owners to connect up to eight of the company’s Beolab speakers for a truly immersive TV performance. Retailing from €18,500, and available in Band & Olufsen stores from October, Beovision Harmony will be on display at Milan Design Week from 9th to 14th April as part of the exhibition 93 years of magic: a dialogue between past and present. There visitors will be able to walk through an installation curated by B&O alongside museums and collectors, showcasing many of the manufacturer’s greatest triumphs throughout its lifetime. And keep your eyes peeled here for our initial impressions when we get to try out the Beovision Harmony for ourselves this week.